Beautiful 42" long Swiss Velvet lead. Colours to match all collars. 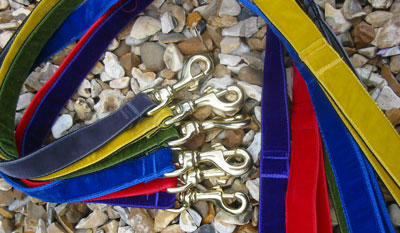 If you would like me to match the lead colour to the collar in your basket there is an option button for that too. 20mm width only suitable for lightweight dogs due to lighter trigger. 25mm for all breeds. Solid brass trigger. Fully washable at 40 in a machine.